The "Largest Cruise Ship in the History of Italian Shipping" The board of Costa Crociere on January 19 approved the issue of a letter of intent for the construction of a new ship at Finantieri. Value of the order is about $450 million. The 951-ft. (290- m), 112,000-ton vessel will be built in the Sestri Ponente yard in Genoa, scheduled to enter service in summer 2005. Designed to carry 3,600 passengers in 1,502 cabins, the ship will be bigger than the current fleet admiral Costa Fortuna which joined the fleet in November 2003 and its sister Costa Magica at the moment under construction at Sestri Ponente. On completion the vessel will become the largest cruise ship in the history of Italian shipping. The ship will be powered by two 21 MW diesel electric units and will operate all year round in the Mediterranean. In addition two swimming polls will be covered in order to be in use all year round in any climatic condition. As a result of an agreement of September 2003 between Costa Crociere and TIM cell phones will be operable on board. Pier Luigi Foschi president and managing director of Costa Crociere said "our decision to increase capacity resulted from the full acceptance of our product by the market and an expected continuing growth of demand for cruises in Europe. We also continue our commitment to develop passenger ship building in Italy where Italy is the world leader. 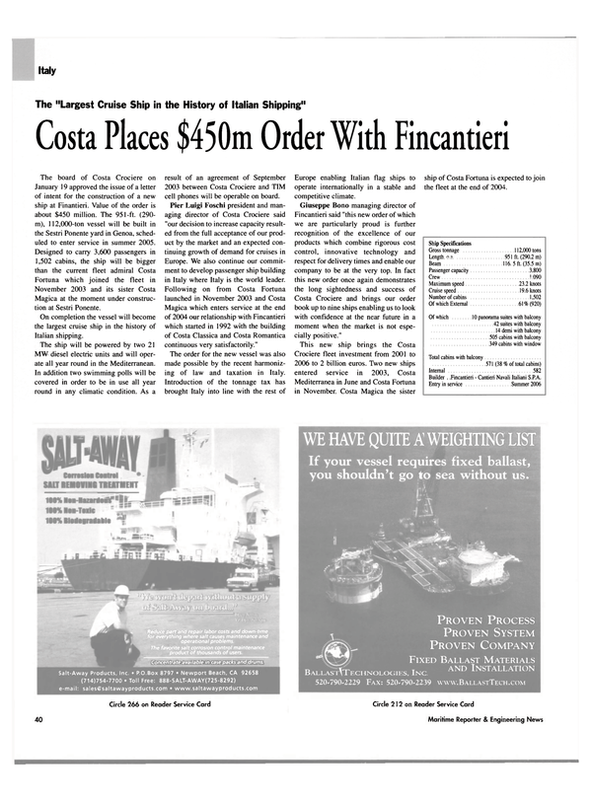 Following on from Costa Fortuna launched in November 2003 and Costa Magica which enters service at the end of 2004 our relationship with Fincantieri which started in 1992 with the building of Costa Classica and Costa Romantica continuous very satisfactorily." The order for the new vessel was also made possible by the recent harmonizing of law and taxation in Italy. Introduction of the tonnage tax has brought Italy into line with the rest of Europe enabling Italian flag ships to operate internationally in a stable and competitive climate. Giuseppe Bono managing director of Fincantieri said "this new order of which we are particularly proud is further recognition of the excellence of our products which combine rigorous cost control, innovative technology and respect for delivery times and enable our company to be at the very top. In fact this new order once again demonstrates the long sightedness and success of Costa Crociere and brings our order book up to nine ships enabling us to look with confidence at the near future in a moment when the market is not especially positive." This new ship brings the Costa Crociere fleet investment from 2001 to 2006 to 2 billion euros. Two new ships entered service in 2003, Costa Mediterranea in June and Costa Fortuna in November. Costa Magica the sister ship of Costa Fortuna is expected to join the fleet at the end of 2004.